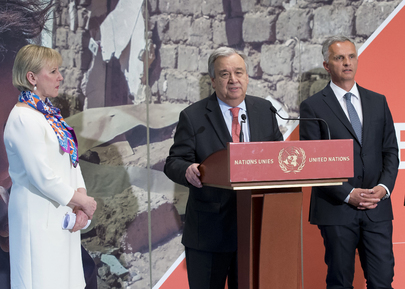 Secretary-General António Guterres (centre) speaks to journalists following the pledging conference for the humanitarian crisis in Yemen, which he hosted jointly with the Foreign Ministers of Switzerland and Sweden as co-chairs. The event resulted in $1.1 billion being pledged, which is more than half of the amount of the $2.1 billion appeal for the year. Also pictured: Margot Wallström (left), Minister for Foreign Affairs of Sweden; and Didier Burkhalter, Head of the Federal Department of Foreign Affairs of Switzerland.